At least this is one of many problems at the parastatal, other issues are the disintegration of infrastructure, the collapse of collieries and the failure to maintain equipment. The state-run company is also being investigated for a R43 million irregularity, the controversial sponsorship of business breakfasts at The New Age all while begging for money from the treasury and refusing to abide by the national energy regulator’s decision with regard to structured annual increases. As I fumbled around in the dark, it appears this is all basically a form of sabotage of the ersatz capitalist system that runs on card swipes, electricity and mass hysteria panic shopping in the run-up to the Christian pagan festival called Xmas. In essence, we have evolved into a sabotage system in which the party technocrats are the ones destroying the economy (alongside civilization), and where private capital is perhaps better positioned to do something about it than central government. While I waited outside for a minibus taxi in a queue of despondent working-class shoppers, whose only opportunity of getting any holiday shopping done over the weekend had just vanished into a cloud of coal-dust, I thought: Does anyone get that oligarchs, union bosses, and monopolists are the ones benefiting from digging coal out of the ground and shoving the carbon into our atmosphere? Does any one of these disheartened shoppers, who look like they just got their pants kicked in, once again by the Zuma administration, (consider the ill-timing of the blackout) realise that Eskom is nothing more than a massive Rube Goldberg machine that serves little purpose other than to drain our economy? So much for South Africa’s National Development Plan, this is a National Development Disaster. South Africa didn’t have to spend a cent on the free market, eco-friendly power station pictured below on the left. The fossil fuel monster on the right designed by a committee in the SACP cost taxpayers billions, is driving a R20 billion rand bailout by treasury, that’s right R20 billion, and has already been sold in a massive Islamic asset-for-loan, buddies in exchange for deals bond scam that indebts the country for eternity while driving dependency and climate change. No wonder, in order to service the bail-out of Eskom and other foibles, like the Abil fiasco, the Zuma administration has had to sell the state’s stake in Vodacom. Selling the roof to pay for the rent is not the solution to our energy problems. Hanging onto ideological concerns in a mixed economic system where the only winner appears to be the free market, seems myopic in the extreme. 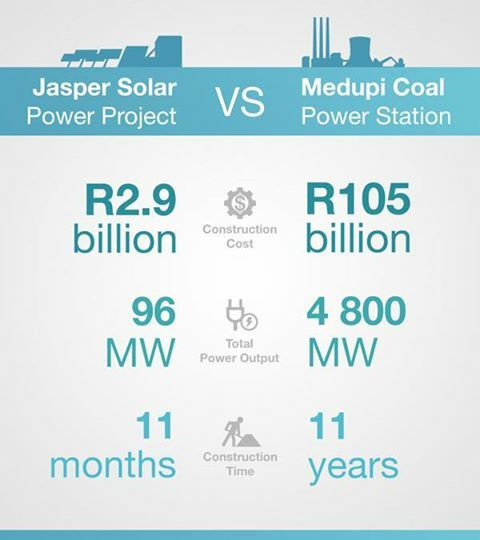 Time to let go of the notion that Eskom will ever pay its way. The bail-out money would have been better spent simply putting cash into every citizens banks account and letting the free market provide electricity. Expect more bail-outs next year as Eskom continues to plague consumers with erratic voltage.